Q. If God inspired the Bible in the first place why are there differences in the Hebrew and Greek manuscripts, and why do the common translations differ among themselves? God has inspired his word so that every word as originally given was as he intended. God has marvellously preserved the original manuscripts in an abundance of copies far more numerous than for other ancient writings. The more manuscripts we have the more we are satisfied that we have the original text in doctrinal purity and very near the exact wording of the autographs. Most copyist's errors do not even show up in translation, and the others do not make any Christian doctrine uncertain. There is no need for division in churches over the common Bible versions. An honestly executed translation brings God's message to us even if we cannot read Hebrew or Greek. Translations vary in quality but where the meaning is faithfully conveyed verbal differences among them are not of great consequence. All translations must be tested by the Hebrew and Greek texts. The Old Testament was written in Hebrew (with some small sections in Aramaic). However, by about 200 BC the influence of Greek culture was such that a translation into Greek became necessary. It was made by Jewish scholars and is called the Septuagint or LXX for short because of the tradition that 70 scholars did the work. The translation was done over a period and is often free. The first five books (Genesis-Deuteronomy) are translated in quite a literal way, the rest much less so. Many of the quotations in the New Testament come from the LXX and sometimes are different in detail from the standard Hebrew text. See this for example in Acts 15:16-18 (Amos 9:11-12) or Hebrews 1:6 (Deut 32:43). Another example is the use of 'tongue' for 'glory' in Acts 2:26 (Psalm 16:9) or 'angels' for 'God' in Hebrews 2:7 (Psalm 8:5). In quoting the LXX the NT writers do not endorse everything in it, but found it of practical utility for ordinary purposes. In other cases the Greek translation is a very exact rendering of the Hebrew, while in still others the NT quotes the Hebrew in a way which brings out a particular idea inherent in the original without giving a literal rendering. A good example is Matthew 2:6 (Micah 5:2). In some cases these quotations probably represent a variant reading from the LXX (eg. Matthew 12:18-21 compare Isaiah 42:1-4). It is clear therefore that the very earliest Christians believed that all Scripture was God-breathed, but also accepted that this did not mean the surviving manuscripts were in every respect flawless. They also recognised the difference between the Hebrew text and a translation, and used a translation that certainly departed from a literal type of translation to a greater extent than many modern English versions. The rest of this article will concentrate on the New Testament although the basic principles apply to the Old Testament as well. Incidentally, the Dead Sea Scrolls discovered in the mid 20th century include copies of almost every OT book and are dated about 100BC, that is, 900 years earlier than the copies we had previously. They are for substance identical. Finding the correct reading is often quite easy, but it's not simply a matter of counting the number of Greek manuscripts. We have to weigh the different families of manuscripts that developed in different centres. We need to look at all the branches, even if some did not last long, to see what the original stem was like. For example, churches in Caesarea and Alexandria were suppressed under Moslem rule after the 7th century, while the church at Rome did not use Greek much after the 4th century but Latin. However, the church at Constantinople constantly copied its form of manuscript since it was in daily use until the Turkish invasion of AD 1453. If we put all the Greek manuscripts together - there are over 5,000 known, 95% being later than the 7th century - the manuscripts from Constantinople's sphere of influence will dominate. Indeed, we call the texts from this branch of the family tree Byzantine (because it was used in Constantinople), or the Majority text. It has a tendency to harmonise different readings instead of choosing between them. But of course the evidence of these manuscripts is not of itself a reliable guide to the original reading since there are other branches of the family tree. Their form of text has also been preserved in God's providence. Again, more recent texts are not automatically excluded since they may be copies of earlier manuscripts. Also older manuscripts are not automatically good ones. As well as the Majority texts two other major families are usually accepted, both dated to the second century. The so-called Western text type was typical for writers from North Africa and Europe such as Tatian, Justin, Irenaeus, Tertullian and Cyprian, and in the Old Latin translations from around AD 180. It is characterised by a tendency to paraphrase. 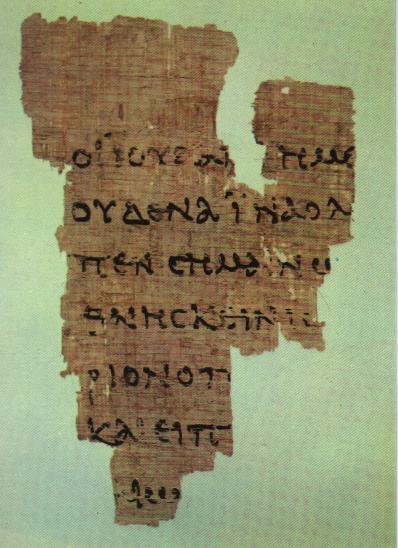 The Alexandrian text type was commonly used by writers such as Clement, Origen, Dionysius and Cyril. Far from Origen (185-254) being the creator of this text type, it dates from before his time. When all the forms of text used in the different parts of the early church are carefully compared a text even closer to the original than the Majority text can be prepared. Such a text is used by most modern versions. We know that the Majority text type originates in the 4th century because no manuscript earlier than AD 300 has its distinctive readings, no version before 300 has its text type and no Christian writer before that date quotes a distinctively Byzantine reading if proper critical editions of these writers are examined. The very popular preacher, John Chrysostom (347-407), used a text something like the Byzantine. The Syriac Peshitta is Byzantine in the Gospels and is sometimes said to about AD 180. However, even if true, this view would date the Majority text at about the same age as other text types and so not prove its superiority to them. In fact, the Peshitta appears to have been produced about AD 400 as a revision of the Old Syriac versions which were of Western text type. The Greek version became so venerated that fresh translations to take account of changes in the language were not made. Even today the Orthodox Church in Greece seeks to restrict the use of the Bible in Modern Greek and the average Greek does not understand in detail the liturgy of his church in the ancient Koine. The same thing happened to the Latin Vulgate produced at Bishop Damascus' request by Jerome about AD 390 as a revision of earlier Latin translations. At first it was criticised but ultimately (despite changes over the centuries) was regarded by the Council of Trent (1646) as the only authentic version. In some parts of the Protestant church today a similar thing has happened with the King James Version of 1611. Printing was invented in Europe in 1450. When Constantinople fell to the Turks in 1453, scholars brought Greek manuscripts of the NT to the West. The Roman Catholic humanist, Desiderio Erasmus, published a printed Greek text in 1516 and a second edition in 1519. A third edition was issued in 1522 and a fourth in 1527. The 1519 edition was the basis of Luther's Bible. In 1551 Stephanus, a printer in Geneva, released a printing of Erasmus' 4th edition of the Greek text along with the Latin Vulgate and Erasmus' Latin translation in parallel columns. In this edition the New Testament was divided into numbered verses for the first time. Calvin's successor at Geneva, Theodore Beza (1519-1605) prepared no less than 10 editions of the New Testament with annotations. In 1633 Elzevir of Leiden printed a Greek New Testament substantially the same as Beza's small 1565 edition. The preface made the claim that the reader had 'the text which is now received by all' hence the expression 'received text'. However, it is based on only a handful of largely late (12th century) manuscripts of the type used in Constantinople. The 'received text' is not the best text that could be constructed from the Majority text family: over 1,000 changes would be required to achieve this. Indeed, in a dozen places the 'received text' has readings unsupported by any Greek manuscript. The most notorious are certain words in 1 John 5:7-8 commonly omitted today but inserted in Erasmus' 3rd edition. These words do exist in two Greek manuscripts (both late) and in modern writing in the margin of two more. In each case the wording shows they were derived from Latin translations. A text like the 'received text' was the basis of all Protestant translations from Greek before 1881, including the great King James version of 1611. This translation was not immediately accepted by all English-speakers, particularly Scots. It was a generation before the Geneva Bible of 1560 (the Bible Shakespeare used) was supplanted. Many Puritans of the mid-1600s wished a more thorough translation which did not retain the old ecclesiastical words (such as 'bishop' for 'overseer.') since these tended to endorse practices in the Church of England unknown to the New Testament age. Others argued for revision on other grounds. However, the general accuracy and majesty of style of the K]V were not to be denied. In an age of few books, it became the staple for those who could read and also shaped the English language. Some 400 errors in the original printing were corrected and the spelling standardised by successive editions, the most recent being 1769. The important preface The Translators to the Readers (now only found in library editions) rejects the notion of a perfect translation. It affirms that even the very worst English Protestant translation may be regarded as the word of God, states that the translators sought to make a good work better, and justified the use of the earlier work of men who might have had wrong views on religious matters but were good scholars nonetheless. For example, the KJV translators used the Roman Catholic Rheims NT of 1582. The translators vindicated their decision to include some variant readings in the margin saying it is better to be cautious about obscure things than argue about them. Some examples of marginal readings are: when correct word doubtful - Rev 15:3 (saints, nations or ages); when verse in doubt - Luke 17:36; when meaning doubtful - Luke 17:21 (within or among). Critics of modern translations claim that the underlying textual basis is corrupt. The facts are otherwise. Two scholars of the Church of England, B.F.Westcott (1825~1901) and F.J.A.Hort (1828-92) were particularly influential in establishing the principles of textual comparison and analysis. Whatever their doctrinal views - and the Church of England in the later part of the 19th century was hardly noted for its orthodox BibIical theology - Westcott and Hort were very competent scholars. Such a champion of orthodoxy as B.B.Warfield, the author of the standard defence of the inspiration of the Scripture, agreed with their basic approach. Westcott and Hort argued that the text type represented by the 'received text' originated in the 4th century. This is acknowledged as correct by later scholarship (see above). But the text type they regarded most highly was that found in two great bound volumes - Sinaiticus (obtained from the monastery of St Catherine at Mt Sinai and published in 1862) and Vaticanus (kept in the Vatican Library from before 1475 and photographed and published in 1890). Both manuscripts come from the 4th century. In general they are both Alexandrian type texts (although Sinaiticus includes some Western readings), and show a preference for shorter readings. Later scholars, while not having quite the same view of Sinaiticus and Vaticanus as Westcott and Hort, accept the broad principles of their work but give more weight to some Majority text readings. Westcott and Hort were contemptuous of the 'received text' and some of their critics replied in kind. The High-Church Anglican scholar, Dean John Burgon, did not understand and/or rejected the genealogical principle and has been followed by a few others whose chief influence today is through independent churches or on the fringes of established denominations. Since liberal and modernistic scholars have often been associated with recent translations there has been an aversion to them by conservatives that in some cases is quite excessive. Obviously there is scope for difference of opinion about the weight to be given to particular manuscripts in any particular case, but this is of no great importance for ordinary Christians, and is certainly nothing to worry about - nor to split churches over. The New King James Version (1982) is recommended for those who wish a version in continuity with the KJV but with more modern language. It is sometimes said that the modern versions are weak on the deity of Christ. The argument is that the modern versions choose the variant or translate the text so as not to support the doctrine. If this was so the doctrine is still amply attested in many other places but, in fact, it is not so with the major modern translations. If one examines John 1:1, 18; Acts 20:28; Rom 9:5; 2 Thess 1:12; 1 Tim 3:16; Titus 2:13; Heb 1:8 and 2 Pet 1:1, the RSV and NEB accept four of these nine passages as unambiguous references to Christ's deity, the KJV and GNB accept five, Westcott and Hort and RV six, and the NASB, NIV and NKJV seven. So much for the alleged bias! One can certainly understand a preference for retaining familiar words, but the vehemence of many attacks on modern versions and the extreme claims made for the KJV are very disappointing. That strict Protestants should use arguments once propounded against the Protestant Reformers is ironic to say the least. Indeed, the Greek of the NT is not Classical Greek at all but the language of ordinary people at the time without special education (Koine Greek). This became very clear in the 1890s when everyday written materials preserved in the dry climate of Egypt were recovered. The changing meaning of words and the discovery of many more Greek manuscripts led to the production of the Revised Version of 1881 and its American equivalent, the American Standard Version (1901). Although it was closer to the original, through the pedantry of scholarship at the time it lost the beauty of style of the KJV. It needs to be said, of course, that the Bible does not have a uniform literary style. The Revised Standard Version (1952) was an improvement on the language side and was further revised in 1971. The English Standard Version (2001/2007) is a conservative revision of the 1971 RSV. The New English Bible (1970) was a fresh translation rather than a revision but was idiosyncratic and also had few translators of evangelical conviction. The first English version for Roman Catholics made from the Hebrew and Greek rather than the Latin Vulgate was also issued in 1970 - the New American Bible. The New American Standard Bible (1971, revised 1995) is a rather literal conservative revision of the ASV of 1901 and useful for close study. The Good News Bible (TEV) of 1976 is a fresh translation intended for those for whom English is a second language but is too free for my liking, particularly in the OT. The Contemporay English Version (1995) seems to be replacing it. The New International Version (1978) is perhaps the most widely used modern translation and helpfully balances form and freedom. I have used it in preaching for many years. Today's New International Version (2005) is a revision published alongside the NIV. The New Living Translation (1996) is a true dynamic equivalence version; its forerunner, The Living Bible (1971) was a self-declared paraphrase. It should be kept in mind that the publishers of Bibles have particular axes to grind in the interest of furthering their business or particular views. For example, this reviewer cannot see sufficient difference between the NIV and the ESV to have warranted the criticisms of the NIV offered by ESV supporters. The differences between the underlying texts should not be overemphasised, nor even the different approaches to translation. There will always be some difference of viewpoint but the cause of God is not in danger. All translations have strengths and weaknesses. For this writer the list of weaknesses is longer with the KJV than the NIV because of the less exact underlying text, outdated language and, on balance, more translation problems. The fundamental principles discussed in this article have been known through the ages by scholars even if they were not so scientifically developed and applied. The Reformers of the 16th century were aware of them. It is striking to think that the Scriptures have come down to us in God's providence often through the hands of those who did not acknowledge Jesus as the Messiah or who did not understand and teach the Biblical message. And despite the sifting by scholars, many of whom were not believing men, the Scripture comes from their hands in full integrity: no other books are on a similar plane and entitled to claim a place in it, no doctrine has dropped out, no truth lacks adequate textual support, and the essential integrity of the text for everyday purposes is undoubted. Get hold of a good modern translation and stick with it. Read carefully, study prayerfully, memorise constantly, obey consistently!